Charis Leos is an American award winning actress and singer. Born in Panama into an Army family, Charis has traveled the world. She went to school in Honduras, Hawaii, and all over the main land US before graduating from High School in Carlisle, Pennsylvania. Charis attended college as a theatre major at the University of North Texas, and received additional training at the prestigious Northwood/Institute for the Advanced Study in Theatre Arts, where she was a Mary Martin Scholarship recipient. She had the honor of meeting Mary Martin, and performing for her at her Lifetime Achievement Award ceremony at the Players Club in NYC. Charis knew from an early age she wanted to entertain others. Her first role as Suzy Snowflake in a Christmas production in preschool gave her a thirst for the stage. At the age of 5 she appeared as the youngest of the Snow children in the West Point Players production of Carousel, and her scene stealing antics were mentioned in a review. 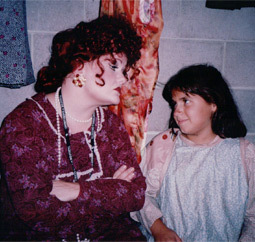 It was at this point that her parents realized they had a character actress on their hands! An active member of Actors Equity Association for over 25 years, Charis has had the pleasure of performing at professional theaters all over the country. She was a member of the improv comedy troupe “4 out of 5 Doctors” in Dallas, and has appeared in numerous live industrial shows, done voice over work, appeared in film and on television and was a singer at the Dunes and Mint hotels in Las Vegas, in the Sandy Hackett Showcase.